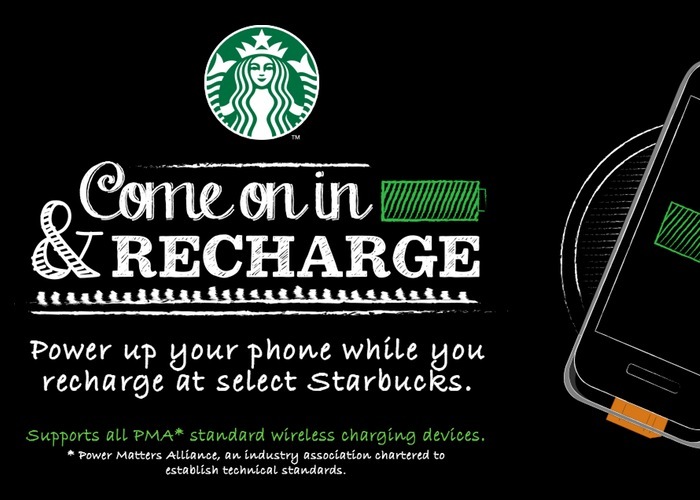 Starbucks and Duracell have this week announced a new partnership that will allow Starbucks visitors to be able to charge their mobile devices whilst enjoying a cup of coffee using new Starbucks charging stations. Starbucks will be rolling out new Duracell Powermat charging stations across the US in Starbucks and Teavana locations, starting in stores located in San Francisco. The new Starbucks charging stations will offer customers wireless charging for smartphones and tablets requiring no cables and for no extra cost. Starbucks hopes to install more than 100,000 table chargers using built-in Powermat charge pads. To be able to charge your smartphone, or divice will need to support wireless charging and the Starbucks charging stations supports all PMA standard wireless charging devices. So even if you smartphone doesn’t support wireless charging perhaps your back battery does. For a list if all the locations that will be supporting the Starbucks charging stations as they rollout, jump over to the Starbucks official website as well as the ability to purchase wireless charging batteries and cases for your devices.